Strolling through the quite provincial town Berdychiv, it is hard to believe that it used to be a large cultural and economic center. A long time ago, it was called the 'town-fortress' and 'Volyn's Jerusalem.’ Only the majestic, ancient buildings, standing in stark contrast with the unremarkable Soviet-era ones, remind us about the peculiar past of this picturesque city. The history and development of the town are inseparably linked with the Monastery of Barefoot Carmelites' Order. Nowadays, it is not only the main architectural attraction of Berdychiv, but is also the vivid illustration of the key moments in its history. 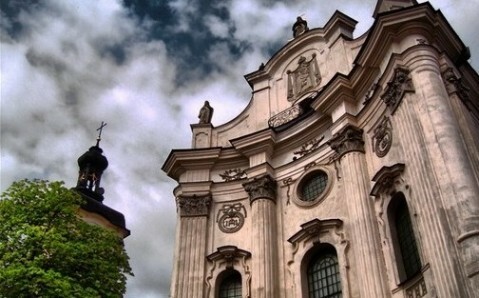 The Monastery, which looks more like a well-fortified medieval castle, was founded in the 17th century by Polish magnate and political figure Janush Tyshkevich. The legend goes, being held captive by Tatars, he had a dream in which monks prayed for his release. Having escaped, the magnate met the monks of the Barefoot Carmelites' Order and in gratitude promised to build a temple for them. 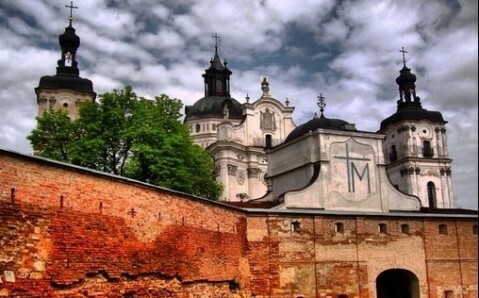 The castle - Tyshkevich's manor - became the foundation for the future monastery and was rebuilt by Carmelites in 1627. Soon, the monks created an underground church with nearby, built vaults and household buildings, and fortified the defensive walls of the fortress. 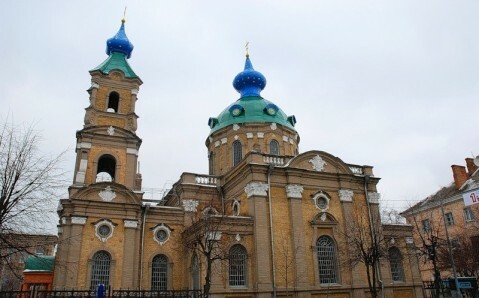 One hundred years later, they raised the beautiful Mariinsky Church in Baroque architectural style, which is now the decoration not only of the monastic complex, but of the entire town. 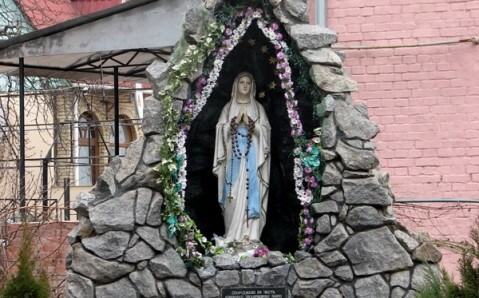 The mystical icon, located in the church, attracted numerous pilgrims to Berdychiv. Yearly fairs attracted trade and craftsmen. To be able to house everyone, the town had to grow, and soon it became the prospering trade and cultural center. At the beginning of the 19th century, after Berdychiv and other Ukrainian lands joined Russia, Jews started to actively settle in the town. At that time they made up almost 80% of local population. This was because of the so-called ‘Jewish line,’ a geographic line near Berdychiv, to the east of which Jews in Russian Empire were not allowed to settle. It was at that time that the town was called Volyn's Jerusalem. One of the most tragic pages in Berdychiv’s history book is connected with its Jewish population. During World War II, Nazis organized a death camp here, killing almost 40,000 Jews. Today, the Jewish community of Berdychiv is just several hundred strong, but thousands of pilgrims come here yearly. They are attracted by the Jewish cemetery and the burial vault of Leva Itshak - the preeminent Jewish philosopher and one of the founders of Hasidism in Eastern Europe. 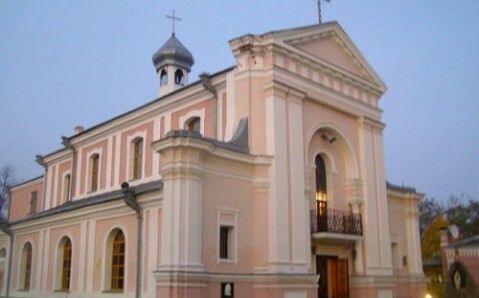 One more very interesting attraction in Berdychiv is the St. Barbara's Church, amazing with its splendid Baroque forms. However, the temple is notable not only for its striking beauty, but also for the multitude of famous people who have visited it in different times. For example, at the beginning of the 19th century, the famous composer Frederick Chopin was taught to play string instruments at the church. And a little later, the well-known French writer Honoré de Balzac was married here. Although it is hard to call it a tourist center, Berdychiv definitely deserves a one-day introductory tour! Location: Berdychiv is located 43 km (26 miles) away from Zhytomyr and 230 km (143 miles) away from Kyiv. There is a regular bus and railway connection between the cities.